This lesson covers the names of the colours in French, and how to say the French colors. Colours describe things. Words that describe things are called adjectives. Colours are therefore adjectives. Remember that if a colour is describing a feminine object or thing, then you must use the feminine form of the colour. The table below teaches the colours in French. The first column shows the English word, the second is the masculine French word for the colour, and the second column is the feminine. Exceltra courses use the French colours to help you remember words that are similar in French and English. In such cases the Memory Trigger picture features the French colours of red, white and blue, and/or the French flag. For example the verb to specialize in French is spécialiser, this being very similar to the English. 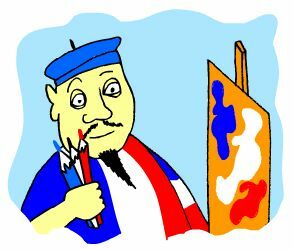 So to remember this word, we suggest that you imagine a French painter who specialises in the French colours, and we provide a cartoon picture to assist with the memorisation process. Click here to see more about how the colours in French can be used in this way. There are lots of words in French that are similar to the English words. Most of these were brought over by the French who conquered England in 1066, and subsequently ruled the place for 400 years. About forty families of words convert from English into French with a few minor adjustments, and learning these can greatly speed up your vocabulary acquisition. Remember however that these are not necessarily the most common words, hence you should learn the most common words first, then BROADEN out your vocabulary by learning these cognates (as they are called). Look out for exceltra's course of these 4000 words that we call 'turboboosters'. Likewise the same applies to Spanish and to Italian. Look out for our Spanish and Italian turbobooster courses. 200 Words a Day! How we Use the French Colours in our French Lessons to help remind of similar words.